#Oshbash 2016: Did Someone Say BACON? For fans of EAA AirVenture Oshkosh, we all know there are too many things happening all at once to see everything. So when I host Airplanista's annual #Oshbash social media meetup events, I never really know who might drop by. The one constant though is that it is always fun for those who do find the time to come. For my 2016 edition of #Oshbash, I have teamed up with Chris Palmer of the popular AviatorCast podcast to breathe new life into the event by inviting a whole new (and younger) demographic. Chris is very well connected to the 20-35 year old community of new media aviators, and his enthusiasm for aviation, social/new media and #Oshbash is apparent, and welcomed. 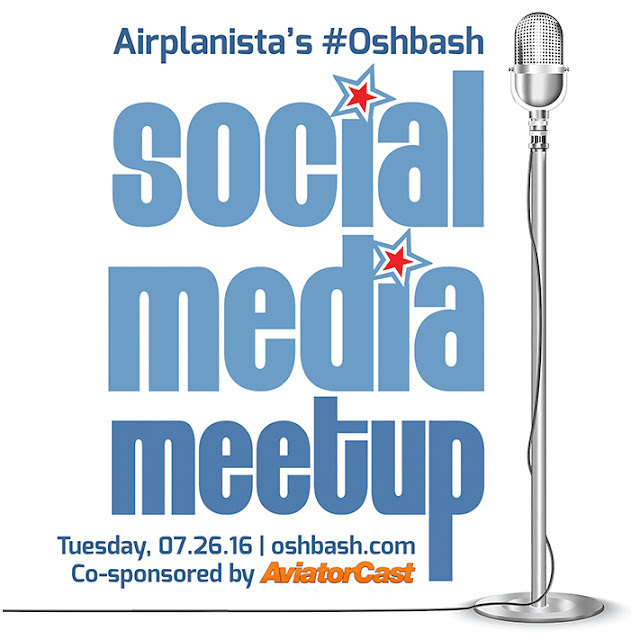 This year's #Oshbash is Tuesday, July 26th, 5:30 - 7:30 p.m. in the usual venue, the EAA Press Tent. But unlike years past when I tried to present some sort of program, Chris and I decided to make this strictly a networking meet and greet, with the entire two hours devoted to meeting up with aviation social and new media influencers, other #avgeeks and maybe an "A" list aerobatic star or two for some good conversation and the anticipated exchange of a few business cards. The answer to the munchies question came to me when watching the television program "Beyond the [Shark] Tank" last week. "Shark" Barbara Corcoran invested in a company called Pork Barrel BBQ, which was introducing a new line of (wait for it)...BACON JERKY. As someone who has never met a morsel of jerky I did not devour instantly, I knew I had to have this at #Oshbash. And, with the help of a refreshment sponsorship from software and avionics developer Mark Spencer, we will be offering a "tasting" of five flavors of Pork Barrel's Incredible Bacon Jerky to the #Oshbash attendees. Spencer is the brain behind the Avilution eXtensible Flight System (XFS), an avionics system that when fully developed could be one of the most disruptive products in the avionics sector since glass panels. Thanks to his support, you will have the tough assignment of choosing which flavor to taste first, Old Fashioned Maple, Honey Pepper, Original BBQ, Sweet BBQ or my favorite, Spicy Sriracha. So, while Chris and I know you will be pulled in several directions at once every minute you're at Oshkosh, try to carve out two hours Tuesday evening to schmooze with a bunch of great aviation media people and a room full of #avgeeks and gnaw on some fine strips of tasty pork. Come for the chat, stay for the bacon. There...I said it.